T he Human Resource technology market which is valued over $15 billion globally shows no signs of slowing down. As every organization aims to grab best talent and follow best HR practices, IT vendors have been introducing advanced and innovative HR Technology solutions every year. Many of the innovative solutions for the human resource functions are coming from the Indian Market, according to a survey by Towers Watson. However, the survey revealed that several key HR processes in India - particularly talent management related processes are still manual or paper based. Hence, enterprises need to optimize the opportunity offered by Indian HR Technology vendors. There are many IT companies providing HR Technology solutions, and enterprises have to opt for the right partner. CIOReview acts as a platform to help enterprise select those partners that have the ability to help enterprises reduce the administrative burden on the HR department to allow them to focus on core HR activities and make HR process transparent. 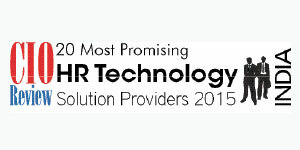 To serve this purpose, CIOReview has come up with a list of 20 Most Promising HR Technology Solution Providers in India. These HR Technology solution providers not only have the technical and consulting expertise, but also have the business acumen for making HR processes transparent by leveraging latest technologies. A distinguished panel comprising of successful CEOs, CIOs, VCs, analysts and CIOReview’s editorial board decided on the names of the 20 Most Promising HR Technology Solution Providers in India.